Product prices and availability are accurate as of 2019-04-16 01:15:57 BST and are subject to change. Any price and availability information displayed on http://www.amazon.co.uk/ at the time of purchase will apply to the purchase of this product. Multi award winning, elegant and floral, Glenmorangie The Original emerges from Scotland's tallest stills. Ten years matured in first and second fill American white oak ex- bourbon casks. Elegant but full-bodied, Lasanta Scotch Whisky has spent ten years in ex Bourbon casks before being matured for two years in Spain Sherry casks, creating warm spice notes. Dark, intense and voluptuous, Glenmorangie Quinta Ruban has spent ten years maturing in ex-Bourbon casks before being transferred into specially selected port pipes. 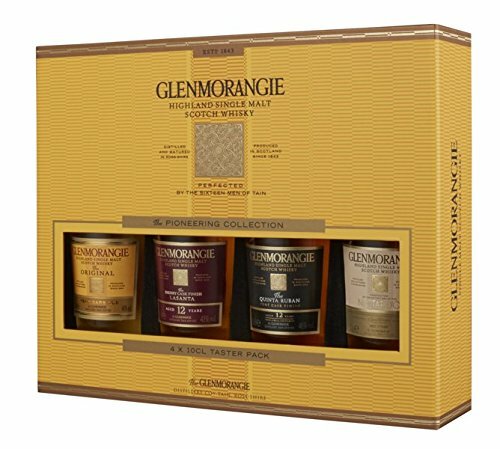 Glenmorangie Nectar D'Or is matured for two extra years in ex- Sauternes wine barriques to develop rich, spicy and dessert-like flavours. Outrageously good sweet-dry balancing. Founded in 1843 in the Royal Burgh of Tain, in the far north of Scotland, Glenmorangie is Scotland's Favourite Single Malt Scotch Whisky. The distillery is famous for its distinctive tall stills - the tallest in Scotland - which play an important role in the development of the complex and fruity house style. We are also recognised as the pioneer of extra-maturation in the 1980s and for innovative work in the field of cask management since the early 1990s. Proudly claiming our whiskies are "Unnecessarily Well Made", producing a range of aged and extra-matured expressions alongside the signature Glenmorangie Original and the groundbreaking Glenmorangie Signet. A perfect gift. Award-winning.